We are back with another edition of Running with the Pack. We featuring the people who make Premier Performance the leader in aftermarket diesel distribution. This month, we are shining the spotlight on Technical Sales Rep, Bill Knighton. One of the unique abilities that our team has is to learn. And as a team, we take every opportunity to develop our knowledge in the automotive industry. Bill’s start with Premier stemmed from his understanding of the automotive industry. Before Premier, he worked within several different aspe cts of the automotive industry including, repair, performance, and retail. Having Bill on our team helps us improve our knowledge base and the service that we can provide to you. When Bill is not at Premier, he is out with his family going on weekend trips and getting in as much time as possible with his wife and little ones. Bill has owned several different vehicles in his time with Premier, starting with a 1996 Ford F-250 Power Stroke. 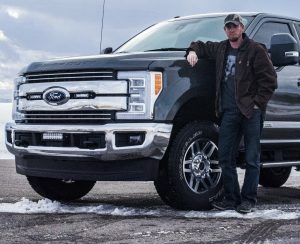 He then moved onto a 2011 Ford F-350 6.7 and then a 2014 Ram Eco Diesel half-ton. Bill then found himself with a family-sized travel trailer and needing something with more towing capacity. Bill now has the 2017 Ford F-350 Super Duty Power Stroke to give him just the towing power that he needs. Having driven so many different vehicles gives Bill a unique look into the diesel world and allows him to better help our customers. Bill’s current truck is outfitted with a variety of aftermarket upgrades, including a BAK Revolver tonneau cover, a Bedrug bed liner, Rigid Industries LED lights, and a K&N intake. He’s also got an EZ LYNK Auto Agent, waiting for the right tuning package to become available. Though everyone on our Technical Sales team is prepared to help our customers with a wide range of topics, everyone also has their interests and specialties. For Bill, one of his biggest areas of interest is Tuners. Tuners have been around for a while, and they are a game changer. 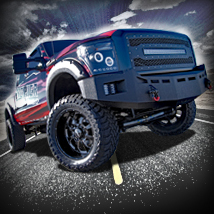 Tuners let you see the parameters of your vehicle, and offer adjustments to those parameters. In short, they help drivers customize their vehicles’ performance and get the most out of their machines. From additional towing power to improved fuel efficiency, the possibilities are endless. Premier has a wide selection of tuners to choose from, including from Edge, Superchips, DiabloSport, Bully Dog, SCT, Smarty, and more. We also recently added Kory Willis Tuning to our line card, a line of custom tunes compatible with the EZ LYNK Auto Agent platform. At Premier, our purpose is to help our customers. And with our expert team, we are able to go beyond just distribution and contribute to your business.